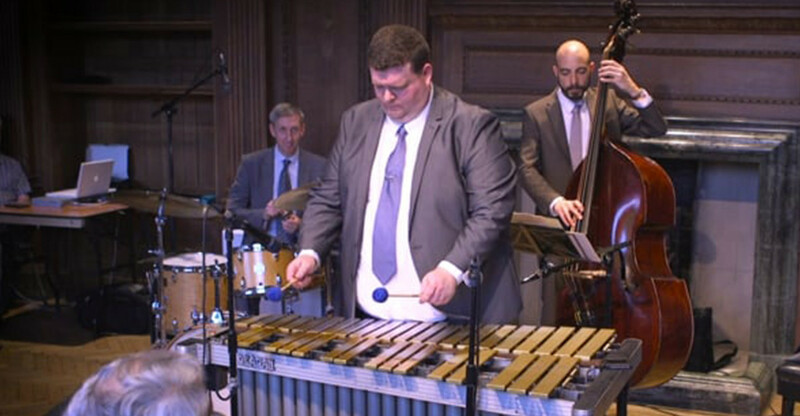 Fresh from the success of the launch of his first album, “Portrait of the MJQ”, in late 2017, and subsequent tour throughout 2018 with that band, vibraphonist Nat Steele has put together a new project called the Nat Steele Quintet, running alongside the ongoing MJQ band, featuring the music of some his favourite musicians. For this concert, he will be playing a selection of compositions Harold Land from the classic Land album “West Coast Blues”, which features Montgomery accompanied by Barry Harris and Cannonball Adderley’s rhythm section, Sam Jones and Louis Hayes. Land came to prominence initially as a tenor player at the forefront of the nascent hard-bop movement in the Clifford Brown / Max Roach Quintet in the mid 50s, and later spread his wings as both a composer and player, contributing some significant, and quirky, compositions to the jazz repertoire. He will also be interspersing the programme with tunes by Wes Montgomery, Cedar Walton, Charlie Parker, and Bud Powell. "A refreshing treat for the ears." "One of the best gigs of the London Jazz Festival." "Effervescence … captured to perfection." Joining Nat in his new quintet are Colin Oxley on guitar, Leon Greening on piano, Adam King on bass, and special guest, coming all the way from New York, drummer Mark Taylor, who has played with many significant figures in the history of jazz (Ray Brown, Benny Green, Al Haig) and is regarded by many musicians as one of the great drummers of the day.